Large and surprising returns of sockeye salmon to the Columbia River in 2010 and 2012 were the result of local ocean conditions and the eating habits of the juvenile fish as they leave the river each spring to journey north along the Washington coastline. While freshwater survival continues to improve as juvenile sockeye find their way from the upper Columbia and Snake river basins to the ocean, the returns counted at Bonneville Dam in 2010 of 386,000 sockeye and in 2012 of 500,000 sockeye salmon are largely due to offshore upwelling that increases chlorophyll concentrations that in turn increase the prevalence of zooplankton near the coast. The sockeye begin to feed on these nutrients immediately after entering the ocean. Sockeye salmon eat at a lower end of the food chain than do chinook and coho salmon, who mostly feed on small fish, and this is giving the sockeye an advantage in ocean survival. These conclusions were published in an article in the May edition of the online journal Fisheries Oceanography (onlinelibrary.wiley.com/doi/10.1111/fog.12056/abstract). The article, "Influence of ocean and freshwater conditions on Columbia River sockeye salmon Oncorhynchus nerka adult return rates," was authored by John G. Williams, Steven G. Smith, William D. Muir. Tom A. Flagg, Richard W. Zabel, John W. Ferguson an Edmundo Casillas, all from the NOAA Fisheries Northwest Science Center in Seattle; and Jeffry K. Fryer with the Columbia Inter-Tribal Fish Commission in Portland. "Sockeye eat further down in the food chain, so they seem to respond to these changes more directly and more quickly than we see with coho and chinook," Williams said, quoted on the NOAA Fisheries West Coast Region website. Williams is the lead author of the article. "We may get good returns for sockeye even when other fish aren't showing the same response." The study evaluated smolt-to-adult returns (SARs) for Columbia River Basin sockeye from 1985 to 2010, finding that during that time SARs varied between 0.2 percent for 1993 and 23.5 percent for 2008. The SARs for the 2010 outmigration, arriving as adults in 2012, was 6.2 percent, but the number of returning fish was high. This was the highest return in numbers of adults and, according to the article, "resulted not from increased survival, but from increased smolt production." "The large adult return in 2012 came from a juvenile migration with nearly double the number of smolts of any other migration, whereas the large return in 2010 came from a migration with smolt numbers that were slightly lower than average," the article says. "Something to do with the ocean was definitely driving these returns, and we saw its influence in both the Snake and the Columbia," said Zabel, director of the Fish Ecology Division at the Science Center and one of the article's authors, as quoted on the NOAA Fisheries West Coast Region website. While the latest adult returns have been very high, the report points out that sockeye returns have remained relatively flat 1985-2010 (there is a slight trend upwards), whereas Fraser River sockeye SARs in British Columbia have declined over the years. On the other hand, Barkley Sound on the West Coast of Vancouver Island is showing similar trends in SARs that the Columbia River sockeye are experiencing. The authors deduce that this is largely due to similar ocean conditions, whereas the Fraser River sockeye enter Puget Sound, a relatively enclosed body of water. In the late 1800s, sockeye returns ranged from 2.25 million to 2.62 million fish, but those numbers crashed in the late 19th and 20th century due to overfishing and habitat reduction due to the construction of Columbia Basin dams. The most recent returns show a surprising resurgence of the salmon species, most of which are naturally spawning fish (95.5 percent). More than 99 percent of the sockeye spawn in Lake Wenatchee and Osoyoos Lake, both on tributaries that enter the Columbia River on the East side of the Cascade Mountains in Washington. The remaining sockeye are the endangered Snake River sockeye from mountain lakes in Idaho. 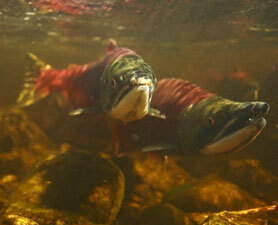 Juvenile sockeye migrate downstream each spring, entering the ocean in May and June. This migration is generally about two weeks later than coho and chinook salmon. The authors considered 19 variables, lumped into two life-cycle stages: 1- freshwater rearing and migratory phase (flow, temperature, snow pack) and 2- the ocean environment. It is the ocean environment that the authors believe has the most impact on sockeye survival, at least in recent years. However, it isn't the ocean at large, which would be indicative of such prediction tools as the Pacific Decadal Oscillation (PDO), but the authors found a better predictor of local ocean conditions in the North Pacific Index (PNI), an index of local ocean conditions developed to predict conditions for oysters in Willapa Bay, Wash. The NPI is a measure of the average atmospheric pressure at sea level over the North Pacific. Changes in pressure lead to changes in wind patterns and temperatures, which cause ocean upwelling. "Upwelling intensity is associated with differing zooplankton composition," according to the article. There are more upwelling conditions in April. Since Columbia River sockeye smolts enter the ocean from May to mid-June, the authors suggest that "lagged zooplankton blooms following April upwelling might influence sockeye smolt survival." "Sockeye SARs correlated positively with April upwelling and negatively with PNI: April upwelling with the highest positive intensity led to higher SARs," the article says. "Ocean conditions and weather patterns leading to warmer and drier terrestrial conditions (higher values of the PNI) in the migration year were associated with lower SARs and conditions leading to cooler and wetter conditions were associated with higher SARs." Scientists know little about sockeye salmon once they hurdle Bonneville Dam, let alone what they generally eat while in the ocean. The results of this study are deductive. Two years of good adult returns, one with a very high smolt-to-adult return and one with a near average SAR, but with more adult fish returning, mean that something beyond river conditions is the cause of the high adult returns. "Thus, although our analyses were correlative, our results suggest that conditions in the northern California Current System that sockeye salmon juveniles first encounter on entering the ocean have a large influence on future adult returns to the Columbia River," the article concludes.